Even before leaving the Wisconsin Dells for Decorah, Storm and I began hunting for unusual nautical adventures. 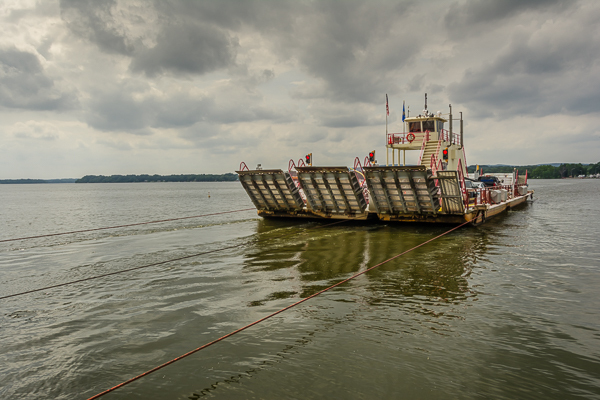 On Lake Merrimac we found a fully automated cable ferry for a unique ride across the lake. After our tranquil float on the Upper Iowa, Storm and I needed some bigger boat action so we headed east for about an hour to Lansing, Iowa and the banks of the Mississippi River. 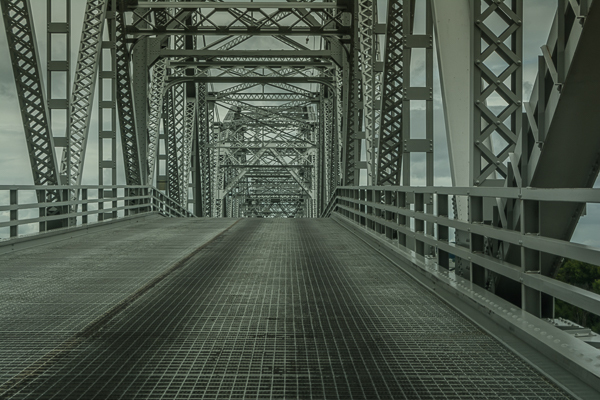 I especially wanted to go back across the Blackhawk bridge which crosses the Mississippi there. When we crossed it on the RV, I had my eyes closed. It is an “antique” bridge (in my opinion) built before lumbering RV’s needed to cross the river and from my vantage point in the RV cab, it looked way too fragile to support us all the way across. Apparently it was substantial enough as when I opened my eyes we were in Iowa and across the river. We spent this day riding down and up the Wisconsin side of the Mississippi river sightseeing at Lock and Dam #8 and #9, watching the barge and train traffic along the river, then driving parts of the Driftless Area Scenic Byway back to Lansing. There we dined at a bar and grill on the waterfront (the only one in town) and watched the barges we had seen in the locks earlier glide under the Blackhawk Bridge to continue their river journey. Your bridge pictures are great! Thank you – it was so beautiful there! The roosters may crow, but the hens deliver the goods.